Dr. William D. Hinn has been involved in ministry since 1973 serving alongside his brother Pastor Benny Hinn. 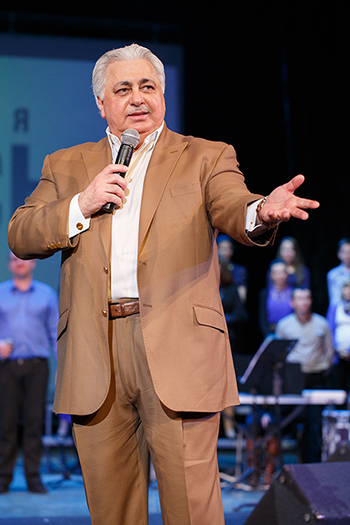 In 1988 Dr. Hinn established Resurrection Life Center in Central Florida, and Ark of Covenant International – a global ministerial network that is an umbrella ministry for his vision to provide ordination, education and fellowship to pastors and ministers worldwide. He has traveled extensively in the United States and overseas where God has used him to help establish and build churches in many nations of the world. His ministry has extended beyond local church walls through his support of missionary work around the globe, including the establishing of the William D. Hinn birthing center in East Timor, Southeast Asia. Dr. Hinn holds three doctorates from different colleges including a Ph.D. in Biblical Studies from Tabernacle Bible College and Seminary in Tampa, Florida, and is also a registered member of the Joint College of Bishops with recognition from the Church of England. His teachings on The Father, the Kingdom of God, and Church Government are in demand at conferences worldwide by pastors and their congregations who look to him for guidance both as a spiritual father and Biblical scholar. In March 2000, the ministry expanded to Southern California and established Resurrection Life Orange County that remains a strong and active family church today. Then in 2012 the ministry expanded further with the establishing of Resurrection Life Dallas Church in the north Dallas, TX area where by God’s grace, Dr. Hinn is being used mightily in unveiling the truth of God’s word, prophecy and healing for the edification of the body of Christ.